Is it time to upgrade the window coverings in your home? If you live in Springfield, PA or the surrounding areas, then you have come to the right place! Here at Blinds and Drapery Showroom, our goal is to make it easy and affordable for you to improve the quality of your home. 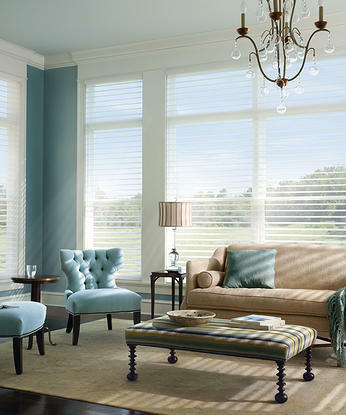 We offer a wide variety of shutters, shades, and blinds for your windows. As you learn more about the benefits of new window coverings, you will be excited to make these upgrades. The benefits far outweigh the costs, making it an easy decision for many homeowners. By working with our experienced team, you will have access to the best experts in the area. How much is your home worth? The quality of your window coverings is one factor that will influence the appraisal rate for your property. If you are planning to sell your home in the future, you should consider the benefits of upgrading the window coverings so that you can ask for a higher price tag. Certain home improvement projects will give you a comfortable space to spend time with your family. At the same time, you can maximize your equity by improving the details of the home before you sell. Even if you aren’t ready to sell right away, you will still benefit later on because of the improvements in property value. If you live close to your neighbors, then you might be looking for ways to improve your privacy. The right window coverings can keep your windows covered in a stylish way. Some homeowners always keep their blinds closed because they don’t want people to see inside. But, this strategy makes your home dark because of the lack of sunlight. Instead of shutting out the sunlight, look for window coverings that offer privacy and sunlight exposure at the same time. As an example, you can choose shutters that have two sections. The bottom section can be closed so that people can’t see inside. At the same time, the top section can be left open to increase the sunlight in the room. Or, you might consider the benefit of shades, which allow you to choose how far you would like to open the window covering. You might roll it up so that half of the window is open to let in the sunlight. Some people choose shades with lightweight fabric, allowing a little bit of light into the room even when the shades are closed. Do you have old, outdated window coverings in your home? Many times these old products are worn and broken, which has a negative impact on the overall appearance of the property. If you want to set the right impression for friends and family, then you need to upgrade the window coverings. There are many stylish designs to choose from, and these products will complement the other design elements in your home. Match the color and materials so that they blend well with furniture and décor that you have chosen for each room. Do you feel like you are spending too much money on monthly utility bills? If your utility costs are going up, then you need to look for ways to improve the energy efficiency of your home. A few small changes inside can boost the insulation and help you manage the temperature. The foundation of energy efficiency is choosing high-quality doors and windows. But, it is also important to make sure that you have good window coverings as well. These products add a little more insulation by keeping the windows covered. Not only will you save money on your monthly utility costs, but it is also possible that you can save money on the initial installation. When you choose a high-quality company, like Blinds and Drapery Showroom, you will see that it is possible to save money and improve your home. We offer discount prices, helping our customers access the best products at rock-bottom prices. We want to make it easy for you to upgrade the finishes in your home. Our team will work with you to find the right products that match your needs. Additionally, we handle the details for manufacturing and installation. You don’t have to lift a finger; let the experts handle the details for you!